Reproduced here by kind permission of the author. Thankyou George ! Although he had piano lessons for three years from the age of eight, and later became enthusiastic about the clarinet, Hank Marvin's first musical instrument was a banjo which he bought from a teacher at school for £2/10/- (paid up at 2/6 per week). His first guitar was a 16th birthday present : an acoustic Hofner Congress which he equipped with a pick-up. 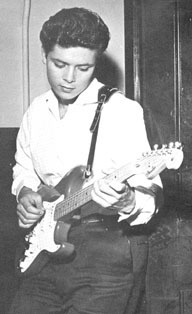 He bought an American Vega guitar from Eddie Silver and used it on the 1958 Kalin Twins tour, before changing to a £30/00/- Antoria solid-body (also marketed as a Guyatone LG50): "It was a solid bodied guitar with a single cutaway, a very small body, and I believe it had two pickups. What attracted me was that it looked like a really good rock 'n' roll guitar. The neck looked enormous because the body was so small, and the machine heads were on one side like a Fender." Hank played that guitar on Cliff's first album, recorded 'live' at Abbey Road. One problem with this guitar, however, was that the neck bowed away from the strings from the sixth or seventh fret to the twelfth. For the 'Living doll' 45, he borrowed a semi-acoustic, with a tailpiece which, when depressed could be depressed to give a vibrato effect. Quality American guitars were hard to come by in those days due to import restrictions. Fellow Shadow Jet Harris played a Besson Star semi-acoustic bass guitar (made by Framus); Bruce Welch played a semi-acoustic Grimshaw Short Scale Deluxe guitar. Amplifiers are unknown, though may have been Selmer; in interviews, Hank often refers to using an amplifier which was about the size of a cornflake packet (and sounded like one!). In July 1959, the Drifters changed their name to the Shadows. They began using Vox amplifiers : the Vox AC15 model, delivering 15 watts output through a 12" Audiom speaker. (The current Vox AC15 is not a replica of this early model). Cliff Richard felt that Hank should have a better guitar. The group knew that Ricky Nelson's guitarist used a Fender guitar, and had seen Fenders on the sleeves of Buddy Holly LPs, so catalogues were obtained from the U.S.
A Fender Stratocaster was ordered by Cliff direct from the Fender factory. Hank's had a tremelo arm, a birdseye maple neck and a Fiesta Red finish (often referred to as Flamingo Pink - coincidentally, one of the 1958/9 Fender catalogues featured a red Stratocaster on the cover) with a white single-ply scratchplate. It was a 1959 model; late that year the Fender factory switched to producing maple necks with rosewood fingerboard instead of all-maple. Cliff bought it for Hank, but the guitar was actually ordered by Dave Lilley, as instructed by Cliff in a letter. The effect of the Fender Stratocaster, Serial Number 34346, was immediate on those who saw it. As Hank put it, in the December 1996 issue of Total Guitar "it was like seeing something from another planet." Bruce Welch, who now owns the guitar, told Neville Martin about it in the July 1996 issue of Guitarist." ..... when it arrived, which was March '59, no one had ever seen anything like it. It had that beautiful birdseye maple neck, the parts were all gold-plated and of course it was that gorgeous pink colour. But first of all, there was the tweed case - the tweed case with all that velvet inside - and when we opened it, it just took our breath away." The group used to take the guitar - and case - down to their old haunt, the 2 Is in Soho, just to show it off. Hank and Bruce both insist that the guitar was definitely pink rather than the orangey hue of the later red Fenders, although to this day Fender experts deny the existence of any such 'Flamingo Pink' shade - which may therefore have been an accident in the mixing of the paint batch. Hank used the guitar for the first time on the group's third single and Cliff's first studio LP. Bruce obtained a Sunburst Fender Jazzmaster and Jet Harris a Fender Precision bass, also Sunburst. Bruce was also photographed with a Fender Telecaster (e.g. the cover of the first Shadows LP and the 'Shadows To The Fore' EP) and until recently has always maintained that these photographs were taken for publicity purposes, and the guitar had been borrowed from a shop in Denmark Street, citing as evidence the fact that on the album sleeve you can see the price tag on the guitar. However, Bruce's memory let him down, as archive film shows him playing both Jazzmaster and Telecaster with Cliff. The group later discovered that James Burton, who played with Ricky Nelson, actually used a Tele and not a Strat! George Fullerton, as production manager, was involved in the creation of 'custom colours' for Fender guitars and basses. He remembered the introduction of 'Fullerton Red'. "The best example of the success of this new color was from Great Britain, where they loved it. The color ... became 'Fiesta Red', the name the paint company used when they manufactured it. The British ordered this new color on hundreds of instruments; to us this seemed odd and very interesting, since the British people are generally perceived as being somewhat conservative." "Vox was one of the first companies to get onto artists and groups so they could promote their amplifiers. In fact, I tried Fender amplifiers first, but preferred the sound of the Vox with the Strat, because I think it was more of a raw sound. The Fender amplifier, to my ear sounded a little too smooth with a Strat, and I seemed to get more guts out of a Vox." "He suggested we made one with two speakers and it was from that comment that the AC30 came." The Shadows had tried the more powerful Fender Twin, but the Vox AC15 provided the sound they wanted, albeit with insufficient volume. Using two amplifiers each was rejected, and Vox finally came up with the legendary AC30, with the group taking delivery of four in late 1959. The AC30 was a 30 watt model with 12" twin speakers and EL84 output valves. Hank's amp was modified with a treble booster to provide a cleaner sound at high volume levels and this model was later sold commercially as the AC30 Top Boost. Bruce also used an AC30, without modification, and Jet Harris had a bass model. Hank's first echo machine came from Joe Brown, and was used on the first Shadows LP. Reg Clark identifies Hank's role : "Hank was one of the first to use an echo unit and because he did, manufacturers took it up ... Hank on his own made what was a small-time thing into big business." "My first experiments with the echo box were relatively simple, first just trying to get the echo that we heard on all the early rock records, then setting it up so that I could play harmony lines with myself... I also experimented with the different types of echo that the box was capable of - in this way I came up with interesting effects, such as the part on 'Wonderful land' where I dampened the strings near the bridge and used a very fast multi-head echo." "When recording, I almost always used an acoustic ... in those days when recording techniques were not as good as they are now. People could never understand how I got the sound on an electric - but in fact it was an acoustic." In fact, for 'Apache' Bruce borrowed Cliff's Gibson J200. On stage, the Shadows often used Gibson acoustic guitars, including a 12-string. In the film 'Summer Holiday', Bruce was seen playing a Gretsch. Some early photographs also show him with a Gretsch on stage. Hank Marvin used a brown Gretsch 'Country Gentleman' on Cliff's 'A Girl Like You' and on 'Nivram' from the Shadows first LP.